Viewing 0 current events matching “coffee” by Date. Viewing 147 past events matching “coffee” by Date. Bring your business cards and meet other liked-minded business people! Introduce yourself to your fellow Portland Tweeters! Enjoy the coffee and treats of Sip & Kranz Coffee Lounge! Hear national speakers and trainers, Rich Fenton and Andrea Waltz! Get up early and work on your side projects with some like-minded geeks! TechCoffee is part running club, part knitting bee, and part hackathon. It's hard to work on all of your amazing ideas after a long workday, so instead we get up early. And we get together, so we have the reinforcement of other people up early, too. A couple hours a week can make a big difference. So bring your laptops and your work ethic to the inaugural PDX TechCoffee. One commit a week is all we ask. So bring your laptops and your work ethic to the 3rd weekly PDX TechCoffee. One commit a week is all we ask. NOTE: We've had some wifi problems in the past, so i recommend having what you need to work locally on your laptop before you come by. EPISODE #10! This is the last episode of the season! A few of us are getting together to do work sprinting for Open Source Bridge. It's a beautiful day, so our plan is to occupy the patio at http://ristrettoroasters.com - Ristretto (3808 N Williams Ave) until my battery runs out, and then enjoy a pint at the http://www.newoldlompoc.com/5thquadrant_home.html - Fifth Quadrant in the early afternoon. I'll head over to Ristretto at 11am. Come join us if you'd like to work on a few things for the conference, or if you'd just like to hang out on this fine day. We'll be working on sponsorship-related things, checking over the schedule, writing blog posts about talks we're really looking forward to seeing, and shoring up details for the Hacker Lounge, parties, and generally fun stuff around the conference. Leslie Hawthorn (formerly program manager for Google Summer of Code), and a few people from the OSU Open Source Lab are also coming out today. We hope you're having a lovely day and hope to see you! NB: We're at a new location for Season 2. So bring your laptops and your work ethic to PDX TechCoffee. Or, if you can't be there in person, join us on IRC at #techcoffee on freenode. One commit a week is all we ask. Note: Extracto doesn't open till 7 due to the holiday, so we're starting late this week. NB Season 2 is ending soon (7-12 will be the 10th episode), so we're discussing locations for Season 3. Check the website for details. NB Season 2 is ending (7-12 will be the 10th episode), so we're discussing locations for Season 3. Check the website for details. NB New location for Season 3! Season 4, episode 10 -- Last episode of Season 10! Season 6, episode 7 - Daylight Savings Edition! BrewPony is launching tomorrow to 50 lucky people! Come watch the co-founders drink massive amounts of coffee and launch the site. Come hangout, drink coffee, and chat with other geonerds. Just look for the mappy people. This week, we're at Coava is SE Portland again. MaptimePDX is the Portland, OR offshoot of MaptimeSF, a weekly meetup of mappers in San Francisco hacking on maps and doing mappy things. In the same tradition, we're aiming to provide meetups for hacking on map projects of all sorts. There's no board or leadership - just some people who are enthusiastic about maps and sharing knowledge. We'll post upcoming events here and summaries of things we learn along the way. Join us! Come hangout, drink coffee, and chat with other geonerds. Just look for the mappy people. This week, we're at Coava in SE Portland again. MaptimePDX is the Portland, OR offshoot of MaptimeSF, a weekly meetup of mappers in San Francisco hacking on maps and doing mappy things. In the same tradition, we're aiming to provide meetups for hacking on map projects of all sorts. But most of all, beginner's and those new to mapping are encouraged to join! Come hangout, drink coffee, and chat with other geonerds. Just look for the mappy people. This week, we're at Glyph in NW Portland. Come hangout, drink coffee, and chat with other geonerds. Just look for the mappy people. This week, we're at Ristretto on Williams. Shaking things up a bit for a Saturday AM thing. Come hangout, drink coffee, and chat with other geonerds. Just look for the mappy people. This Saturday, we're at Ristretto on Williams around 10am. Come hangout, drink coffee, and chat with other geonerds. Just look for the mappy people. This week, we're at Glyph on the North Park Blocks. .
For those with a hankering for World Cup action, Blitz is just two blocks west. Come hangout, drink coffee, and chat with other geonerds. Just look for the mappy people. This week, we're at a NEW location: Ristretto Roasters on NE Couch St.
Workfrom Wednesday comes back to the West Side!! This week we will be going to a Workfrom favorite Breken Kitchen. They have really great good, many tables, WiFi to match. We try to support each location that supports us by buying something. So come hungry, in need of a coffee, and ready to get some work done with awesome people. For folks wanting a great place to get work done or meet fellow digital nomads, join us as we set up shop at The Floyd's Coffee in Old Town -- just when we need that extra boost of caffeine to get us through the afternoon. Workfrom Wednesday comes back to the East Side!! This week we will be going to a Workfrom favorite Tiny's Coffee. They have really great sandwiches, salad and other tasty items, many tables, and WiFi to match. We try to support each location that supports us by buying something. So come hungry, in need of a coffee, and ready to get some work done with awesome people. You can find out more about the space and why it's awesome on their Workfrom page. Come hangout, drink coffee, and chat with other geonerds. Just look for the mappy people. This week, we're at Ristretto Roasters on Williams Ave. This week we will be going to a Workfrom favorite Case Study Coffee. This is the Case Study on NE Sandy. They have a good assortment of snacks and pastries, and snappy WiFi. Right down the street from Case Study is an awesome food cart pod with a beer garden AND WiFi. I will be eating lunch and working there so if you want to grab lunch come join. We try to support each location that supports us by buying something. So come hungry, in need of a coffee, and ready to get some work done with awesome people. There is bike and car parking on the street and the number 12 bus runs on Sandy. This week we'll be going to a Workfrom favorite Fehrenbacher Hof (The Hof) in Goose Hollow. They have full lunch options From Goose Hollow Inn, bagels, pastries and snappy WiFi. We try to support each location that supports us by buying something. So come hungry, in need of a coffee, and ready to get some work done with awesome people. The third edition of a monthly event we’ve been calling “Coffee w/ Co-Founders” will be held Friday July 25th @ 9am at Breken Kitchen (http://www.brekenkitchen.com/) in NW Portland. Come by for this very informal meetup as we discuss our current projects and give each other advice about growing a business here in Portland. We have had a great turnout for each of these events, and with this space housing more space, we anticipate a large gathering of Entrepreneurs. Bring lots of business cards and be prepared to talk to like-minded individuals. Returning to where it all started from, this week we'll be going to a Workfrom staple and favorite Glyph Cafe. They have full lunch options including smaller tapas, AND wine + beer. We try to support each location that supports us by buying something. So come hungry, in need of a coffee, and ready to get some work done with awesome people. Workfrom Wednesday comes back to the West Side, and away to Italy!! This week we'll be going to a Workfrom favorite Cafe Umbria. They have full lunch options including Sandwiches, Pizza, Pastries, Snacks and Drinks (no one worry they do have beer and wine for those staying later). We try to support each location that supports us by buying something. So come hungry, in need of a coffee, and ready to get some work done with awesome people. Coffee w/ Co-Founders was an event created to give Founders a venue to talk about challenges, issues, and what's working. It's a way to network and build on the ecosystem that makes Portland an incredible place to start a business. This is completely informal. Come by, drink coffee, hang out, but most of all, have fun meeting new people who are passionate about what they're working on! Come hangout, drink coffee, and chat with other geonerds. Just look for the mappy people. 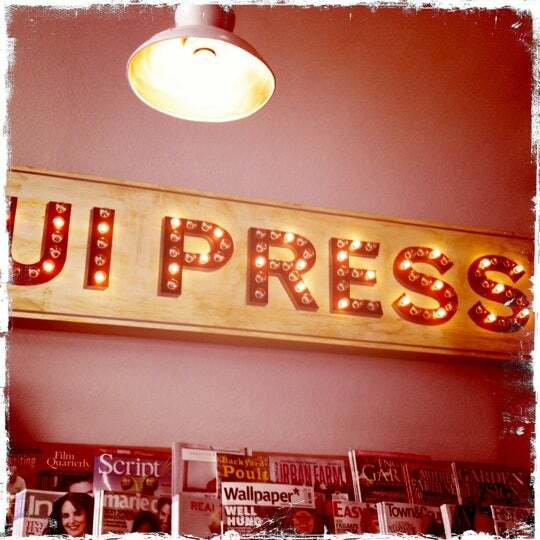 This week, we're at a NEW location: Oui Presse on SE Hawthorne,1740 SE Hawthorne Blvd, Portland, OR 97214. Maptime is, rather literally, time for mapmaking. Our mission is to open the doors of cartographic possibility to anyone interested by creating a time and space for collaborative learning, exploration, and map creation using mapping tools and technologies. But most of all, beginner's and those new to mapping are encouraged to join! Back by popular demand, this week we will be going to a Workfrom favorite Breken Kitchen. For people who don't remember or couldn't make it last time, they have really amazing food as well as wine and beer. We try to support each location that supports us by buying something. So come hungry, in need of a coffee, and ready to get some work done with awesome people. Just an FYI, Breken does close on the earlier side at 5PM. You can find out more about the space and why it's awesome on their Workfrom page. This week we will be going to a Workfrom first, TownShend Teahouse on NE Alberta. They have an absolutely enormous and great tea selection as well as Kombucha. They have light food options but there is a very nice food cart pod with great outdoor seating right next door. We try to support each location that supports us by buying something. So come hungry, in need of a coffee, and ready to get some work done with awesome people. Workfrom Wednesday comes back to the East Side to try something new!! This week we'll be going to a Portland, OR and Workfrom staple and favorite Water Ave Coffee. They have sandwich, bagels, salad, oatmeal, and yogurt as well as some of the best coffee in the city. We try to support each location that supports us by buying something. So come hungry, in need of a coffee, and ready to get some work done with awesome people. A lot of people wanted to go get drinks after Workfrom Wednesday, so that is exactly what we will be doing. Around 4:00, we will move from Water Ave Coffee to Bunk Bar right next door for drinks and food. For anyone who has not been, bunk has some of the best sandwiches in the city. To note, Bunk has happy hour from 3:00-6:00 giving $1 off all well drinks and beers. You can find out more about Water Ave Coffee and why it's awesome on their Workfrom page. Coffee w/ Co-Founders is a casual meet-up meant to foster conversations about what it's like to be a Founder of a new business. Why complain to your spouse about the challenges around your business when other people out there can relate with what you're going through. Come back, drink some coffee or tea, and have a great conversation. Who knows where it will lead? This week we'll be going to a Portland, OR and Workfrom first and portlad favorite Lovejoy Bakers on the SW waterfront right by the Ross Island Bridge. They have many food options and delicious breads. Next door is Green Leaf Juicing Company which provides more options on food and drinks. We try to support each location that supports us by buying something. So come hungry, in need of a coffee, and ready to get some work done with awesome people. Again this week we will be going to a bar after Workfrom Wednesday. If anyone has any suggestions please post them since we are currenelty undecided on where to go. You can find out more about Lovejoy Bakers and why it's awesome on their Workfrom page. Startup Coffee Hour! reinvents the Startup Accelerator as a two-hour flash mob at a coffee shop. The accelerator is like a tavern in an RPG: you can wander around the room and explore freely; you can walk up to anyone and talk to them; you can reacquaint with past companions and team members; you can sit at a table and share a laugh with elders, artisans, and heroes; you can form adventuring parties that may last a lifetime — and that's just the first 15 minutes. Learn more. Portland is an amazing startup town with great people starting exciting new companies. We want to celebrate and foster those ideas, people and momentum. 1 Million Cups meets every week and highlights 1-2 local startup businesses. It is a place for you to pitch your business in front of a growing group of people who want to celebrate and learn from your journey. No muss, no fuss, no pressure just a chance for you to hone your pitch. We meet every Wednesday and spotlight 1-2 businesses for a 6 minute presentation and 20 minute Q&A. We want to hear your story, we want to hear your pitch, We want you. We're excited to have a sponsor this month!! Forge Portland will be providing this month's space and even better, FREE COFFEE!! YES! We've made it to the big leagues people! We've been excited to see the organic growth of this meetup and look forward to seeing you all in November. 1 Million Cups (1MC) is a simple way to engage entrepreneurs right here in Portland. Each week, the 1MC program offers local entrepreneurs an opportunity to present their startups to a diverse audience of mentors, advisors, and entrepreneurs. Presenters prepare a 6 minute educational presentation and engage in 20 minutes of feedback and questioning after they present. Entrepreneurs gain insight into possible ways they can improve their businesses, gather realtime feedback, connect with a community that truly cares about their progress, and walk away feeling like they have advanced their business. The audience also learns a great deal from the presentations. Whether this is through passively listening or deeply engaging with the entrepreneurs, there is much to learn every week from these dynamic and diverse communities. 1 Million Cups is a program run by entrepreneurs for entrepreneurs. For additional updates, please follow us on Twitter @1MillionCupsPDX and connect with us on Facebook. Join us for a cup of coffee and learn about upcoming classes at our info session on Dec. 23 at 7 p.m. Interested in learning more about an offering or Code Fellows Portland? RSVP today! Code Fellows is a Seattle-based digital trade school that provides world-class technical education, career coaching, and job placement services. We offer full-time and part-time programs in various web technologies for every ability level in Seattle, WA and Portland, OR. Portland Startup Week is happening from Feb. 2-6th. It's a week full of amazing panels, talks, and events. Coffee w/ Co-Founders X (can't believe this is the 10th one!) will bookend the week with a great informal morning get together of the area's most incredible Entrepreneurs. Come by, have some coffee, bring lots of business cards, and be ready to meet Portland's next big idea! Come and bring your laptop, grab coffee, and meet Mike Fairhurst, creator of the Wake programming language. Learn about, write in, or guide the design of the Wake programming language at an informal hack night. Brave coders can spend some time working on the compiler (written in C++), while eager ones can try writing things in Wake to provide valuable feedback. Either way, work directly with Mike as questions come up to ensure its smooth sailing! We're taking Coffee w/ Co-Founders and moving it out of the coffeeshop this month. We're celebrating our moving into OMSI's workspace by hosting the next Coffee w/ Co-Founders and this time the coffee is on us! Bring your business cards and be ready to talk to others about what you're working on. EAST Knowledge is going to try a repeat of our first "Coffee Break". The first had a lot of great discussions. We invite you to join us for coffee at Cafe Delirium. We have the room in the back reserved. We're going to hang out for a couple of hours, so feel free to come by, talk shop, show off what you're working on, ask questions and pick each other's brains. We look forward to seeing you there! All are welcome! We invite you to join us for coffee at Cafe Delirium. If you haven't made it to one of our talks, the coffee breaks provide a nice opportunity to drop by and introduce yourself. We have the room in the back reserved. We're going to hang out for a couple of hours, so feel free to come by, talk shop, show off what you're working on, ask questions and pick each other's brains. We look forward to seeing you there! All are welcome! This month we're back in the Pearl! We want to thank CENTRL for offering up their space for the next meetup. As always, make sure you have plenty of business cards. About Coffee w/ Co-Founders: CwCF was created to be a place where other Entrepreneurs can come together to talk about their projects and see what can be done to help each other out. It's a way to discuss challenges, failures, and successes. Join us for Lean Coffee at Viewpoint Construction Software on Wednesday, August 5 at 7:30am. Viewpoint is located at the east landing of the Hawthorne Bridge, at 1510 SE Water Ave. Come to the Tech Center on the eastern side of Water Ave. They will also be providing your morning cup of joe! This event has been growing and we're happy that more than 600 people have joined the group!! We would love to see all of your happy shining faces at Happy Cup on the 27th! As always, bring plenty of business cards and be ready to talk about what you're working on. We're gonna head back over to Coava this month on the SE side of town. We hope to see everyone there as we head into the holiday season. The format is pretty laid back. Come by, grab a cup of coffee, and network with other business owners who are working on incredible projects. We can't wait to hear what you're working on! About Coffee w/ Co-Founders: As a business owner you are faced with many challenges. You're forced to make decisions every day that could make or break your business. Coffee w/ Co-Founders is a way to network with other Entrepreneurs to allow free flowing information with the intent to collaborate and help each other. So often we're challenged and there's very little we can do to express our challenges with the people we work with or the people we care about. Think of Coffee w/ Co-Founders as your own personal support group for business owners. We're all here to help! In the startup world, liquid refreshment is often the fuel that gets us through the day. From a double espresso in the morning, to a pint in the late afternoon, and on to a cocktail in the evening. So as we kickoff Portland Startup Week, join us as we hear from founders and brewmasters of local craft beverage companies as they talk about the business behind the liquids we drink. Tickets are $24 and include snacks, beverages, and an annual membership to Built Oregon. DADO Labs is thrilled to be a part of this year's PSW! Stop by our secret world HQ for a sampling of delectable IoT treats from the DADO platform on our partners' IoT appliances. Get yer IoT on with DADO Labs! See you on the 3rd. It's happening again. Portland Startup Week! We're excited to be teaming up with WeWork at the Custom House for this year's event. Remember last year? Over 85 over you showed up and we nearly shut down Glyph. This year we're taking this to WeWork's event space, but we still have some limitations on space. That being said, we'll have a capacity of 75 people. If you plan on coming to this event please RSVP as this event will fill up quick! PLEASE NO SERVICE PROVIDERS! With the limited space we'd like to keep this event to Business Owners/Founders. WeWork will be providing coffee and goodies! About Coffee w/ Co-Founders: This event is meant to be a very informal gathering of entrepreneurs to talk about their projects, challenges, and successes. This event is not just for tech founders. We usually see all types of business owners from a variety of industries. Come join us for coffee and "tech-talk" at Cafe Delirium! If you are not yet familiar with our group, the coffee break is a nice opportunity to drop by and introduce yourself. We have the room in the back reserved. We're going to hang out for a couple of hours, so feel free to come by, talk shop, show off what you're working on, ask questions and pick each other's brains. We look forward to seeing you there! All are welcome! Join us for our Thought Leader Coffee event at NedSpace: Mayoral Candidate Ted Wheeler will be sharing his insights for taking Portland forward into a bigger and better entrepreneurial future. First I'd like to apologize to all of you for not being more active. I've been a bit overwhelmed lately so I've not been able to arrange a meetup. However, it's been February since our last get together so this is long overdue! We're hitting Breken Kitchen on the NW side of town. The space is not very large so we'll do what we can to find a place that doesn't impact the other patrons. Perhaps we can gather on their back deck. Either way, we'll have placards in the area so it's easily identifiable. Please be sure to patronize this establishment. The worse thing we can do is show up as a big group and not at least buy a cup of coffee (thus the name). C4 is explosive, it is power, it is a tool to create change. We take this energy and apply it to connections, creativity, and community. Let's come together and build on this collective, powerful creative energy in Portland's entrepreneurial and artistic realms. C4 is a chance to stretch your creativity muscles. Come for an exercise in boosting creativity, network with other creatives, sip a coffee and then stay as long as you need with a free coworking day by NXT. This week JoLoMo - what is Smart Mirror? Come and find out. Every week we have a new local entrepreneur building an amazing company here in Portland. They give a short presentation followed up with a great Q&A session where you get to ask questions and ask about the real challenges and triumphs behind the business. As always we welcome everyone interested in startups and founders building great companies here in Portland. Come and check it out and bring a friend. Join us online on the 1MC PDX Startup Slack channel. This week we'll hear from Sonja Skvarla of A Social Ignition who teaches entrepreneurship inside and outside of prison. We run two core programs: The Ignition Option and The Long Haul. This week Joe Vernon of Unifusion - a user-friendly solution for marketers to analyze and report the impact of their marketing efforts without having to create custom dashboards or reports. This week RFPio a cloud-based RFP software is a response management solution that eliminates the friction often associated with responding to Request for Proposals (RFPs). "Talentpair combines machine learning technology with just the right amount of help from seasoned hiring experts to pair companies & talent." This week we welcome StackPath. StackPath is the intelligent web services platform for security, speed and scale. This week Local Dawgs a community pet sitting app. NOTE: We're going to cancel this due to the power outage in the Pearl. Feb 7, 2017 Coffee w/ Co-Founders Startup Week Edition! Portland Startup Week is happening again Feb. 6-10th and, as we did last year, Coffee w/ Co-Founders will meet during this incredible event. Please be aware that we will need to be sensitive to Coava's normal customer traffic. As such, we'll do our best to confine ourselves to the wall in the back side of the shop. We're in the NW side of town this month. Breken is a great place to relax, grab a cup of coffee, or get some of their yummy food. Come join us for some “tech-talk” at the Gresham Library! It's been a little while since we last met, and EAST Knowledge is changing our overall format up a bit. We'd like to do more regular, informal gatherings and have talks when the opportunities present themselves. So with that in mind, we hope you join us in this informal gathering to talk shop, show what we're working on, help each other, and hear from others interested in technology. If you are not yet familiar with our group, this is a nice opportunity to drop by and introduce yourself. We’ll have light refreshments, and some of us may get together for lunch afterwards. We look forward to seeing you there! All are welcome! Get together and talk shop with your fellow nerds. We tend to talk DevOps topics, but anything adjacent is also welcome. If enough people show up we'll follow the Lean Coffee format, otherwise we just hang out and talk. We're trying to get this together every other Wednesday morning. If you can't make this one but are interested, Tweet at @BillWeiss to let me know there's an audience. This month's host and sponsor is CENTRL! This month we'll be at the new Centrl location on the east side of Portland. This incredible space has already been host to a number of great community events. So it makes sense that our community make this one of our stops. Dillin of Centrl will be speaking to you all about the space and will be giving tours to anyone that would like one. Centrl will also be providing coffee for this month's event. We're trying to get this together every other Wednesday morning. If you can't make this one but are interested, Tweet at @PDXCoffeeOps to let us know there's an audience. This month we're trying something a little different. We're going across the river to Vancouver to check out The Bridge Incubator. Dave Barcos will play host to this month's meetup to give us a tour of The Bridge Incubator and talk a bit about what he's doing to help build the ecosystem in our sister city across the river. Best of all, FREE COFFEE!! oin us for a morning coffee and a friendly mingling with like-minded Portland entrepreneurs! Every week on Wednesday morning we have a new local startup team building an amazing company here in Portland giving a short presentation followed up with a great Q&A session where you get to ask questions and ask about the real challenges and triumphs behind the business. 1 Million Cups is a great opportunity to network, and as always we welcome everyone interested in startups and founders building great companies here in Portland. Come and check it out - and bring a friend. Join us for a morning coffee and a friendly mingling with like-minded Portland entrepreneurs! Every week on Wednesday morning we have a new local startup team building an amazing company here in Portland giving a short presentation followed up with a great Q&A session where you get to ask questions and ask about the real challenges and triumphs behind the business. Sep 13, 2017 1 Million Cups - Portland - A weekly presentation and QA with Portlands hottest new Startups. Each week 1 Million Cups hosts great local founders. We hear a short presentation about their company and where its roots and genesis. Then we have a great QA session where you get up real answers about how they built their businesses. It's a great learning experience as well as networking with some of the up and coming startups in our region. A great meetup north of the river to meet local founders. What goes well with coffee? Well, PIE of course!!! This month our host will be Rick Turoczy and the PIE cohort at their new home in the Dairy Building. Rick will talk about the new iteration of PIE and you'll get a chance to meet the new cohort. A HUGE thanks to Deadstock Coffee and Riff Cold Brew for keeping us fueled at the Meetup!